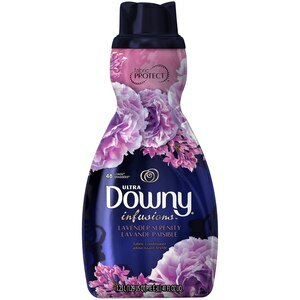 You love your clothes just as much as you love scent so keep them soft and calmingly fresh with Downy Infusions Lavender Serenity Fabric Conditioner. This fabric softener infuses clothes with a touch-activated fragrance of lavender and vanilla, all while conditioning and protecting them from stretching, fading, and fuzz. Use every laundry day to make your clothes smell as great as they look and feel. Touch-activated scent leaves long-lasting freshness. Infuses fabrics with a rich lavender scent. Conditions clothes to help prevent stretching, fading, and fuzz; Keeps clothes looking newer, longer. Biodegradable Fabric Softening Agents (Cationic). Liquid fabric softener can increase fabric flammability. Using more than recommended can increase this effect. Do not use this product: On children s sleepwear or garments labeled as flame resistant as it may reduce flame resistance. On garments made with fluffier fabrics (such as fleece, velour, chenille, and terry cloth).